A voice in my head tells me the bullet had my name on it. I tell the voice that they misspelled my name. Cover by DAVID MACK Finally back in hardcover after ten years! The very first KABUKI volume ever. The foundation of the KABUKI story. The origin. The very beginning of this critically acclaimed series. The HC readers are missing from their KABUKI hardcover collections. And the perfect book for brand-new Kabuki readers to begin with. The last time this volume was in hardcover was more than ten years ago, and it sold out quickly. Since then, readers have been searching for this VOL. 1 hardcover to complete their collections. This prestige hardcover delivers with a whopping 272 pages and extra features. All elegantly collected in a high-end hardcover with an embossed cover, watermarked end pages, a book mark, a dust jacket with all-new cover art and introduction by comics legend Jim Steranko. Maya Lopez, dubbed Echo by the press, is a young deaf woman capable of replicating any action she sees — including an individual’s fighting style. She once nearly took down Daredevil, believing him to be the one who killed her father. After learning that it was actually Wilson Fisk, her legal guardian, who was responsible, she shot him and left New York in an attempt to discover herself. Now, with her perceptions completely altered, can she make sense of the world? Echo embarks on a Native American vision quest to pick up the pieces of her shattered life. Written and illustrated by acclaimed Kabuki creator David Mack. Combining innovative storytelling, painting techniques and page design, Mack has won nearly every major comic-industry award, including the prestigious Eisner Award for Best Painter, and garnered praise from such luminaries as Jim Steranko and The Washington Times. Collecting DAREDEVIL #51-55. From the Eisner award-winning team that brought you Daredevil, Halo, and the Avengers comes another startling new chapter in their first ever creator owned series. You've met Scarlet and now you know who she is and what she wants...the world is a corrupt broken place and she is going to fix it. But how far is she willing to go? She is talking revolution right here in the United States!! But where does one start such a thing? The_Card_Well posted a photo of an Iron Man II sketch card by David Mack. 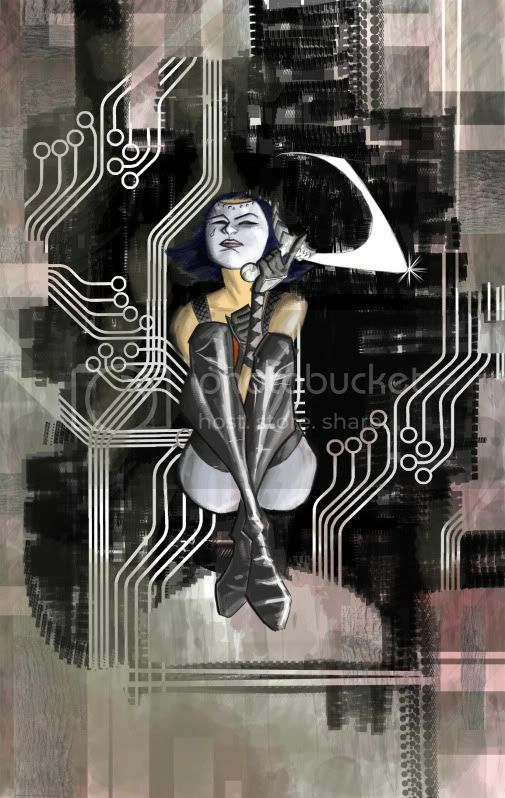 Mike Oeming posted a digital sketch of Kabuki. Thanks to David Mack for sharing photos of himself with Paul Ragsdale at Pittsburgh Comicon 2010 and Burcu at Baltimore Comic-Con 2008. I’ve been very specific in recommending the [Daredevil 2-disc DVD set] because there’s an extra on the second disc which is a documentary called 'The Men Without Fear.' On it DD creators of the past discuss the character in pretty specific detail. They talk about how they went about creating their work, why they did so, and to listen to the likes of Stan Lee, Gene Colan, John Romita, Frank Miller, Kevin Smith, Joe Quesada, David Mack and Brian Michael Bendis is absolutely captivating. Once you see how captivated they are by the character you’ll be simply swept away. According to the Baltimore Comic-Con website, David Mack is scheduled to attend the show, which will be held August 28-29, 2010. #1: Very Cool! RT @manwithoutfear: @davidmackkabuki Nice to see Marvel is reprinting the Vision Quest arc in Premiere hardcover format. #10: A reminder that both gallery exhibits in Paris & Brussels at both galleries will be up through August. #11: Thanks :) RT @sethwolfshorndl: music video by All India Radio? http://bit.ly/b2e8R9 Really fun stop motion light drawing! Justice League Of America #45 (variant cover - $3.99) is available on eBay (Buy it Now: $3.99).